Click on the "Dashboard" tab (in the manage toolbar) and then on "Tags" (in the left menu). 5. Write the name of your album in the text box and click "Ok" to save it. You can now manage its privacy, delete it, rename it and change its color by clicking on the manange icon (at the left of your tag). 6. 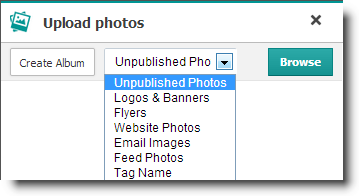 Click on the "Files" tab (in the manage toolbar) and click on the "Upload Photos" button. 7. Select the tag name of your album in the drop down and click on "Browse". Select as many photos as you want on your computer. Click on "Ok" and then on "Done".